Leaving Singapore about 5pm on Wednesday, August 13th, we arrived in Bukit Tinggi around 10pm. Next morning we were up early and at the Mountain Peacock Pheasant stake out before dawn. As it happens, we didn’t need to be so early as the pheasants didn’t turn up until 8am, a female and her chick. They put in two rather brief appearances over the next hour, but still the views were excellent as they were quite close. After two views we started looking for two of Bukit Tinggi’s specialties, the Orange-breasted Trogon and the Silver breasted Broadbill. The trogon was easy, we heard one calling and got great views of a stunning male. Later we heard perhaps the same bird again, and got more very fine views. The broadbill was now where to be found, and all we could see was an nest from earlier in the season. 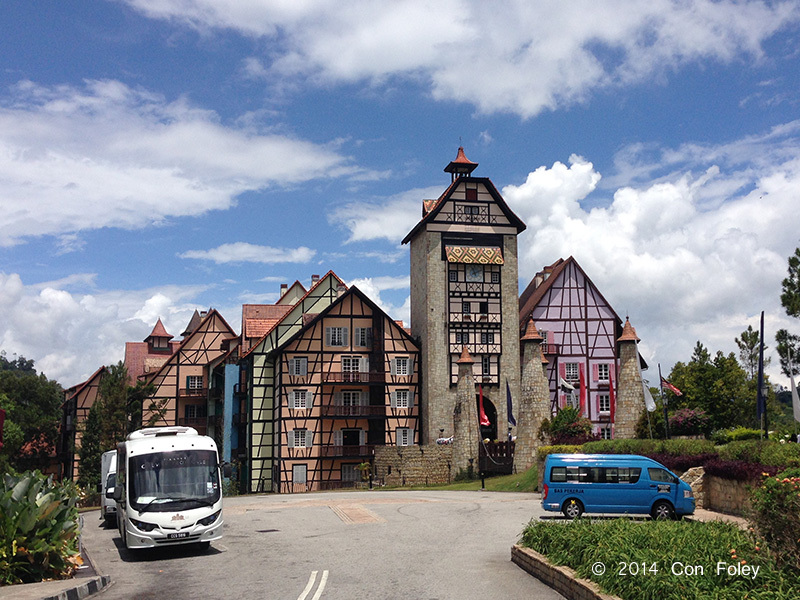 Above is a view of the outlandish French styled Colmar Tropicale hotel in Bukit Tinggi. Of course the Streaked Spiderhunter was chattering away with his cheerful call. Black-browed Barbets were calling everywhere. And we were rewarded with a Gold-whiskered Barbet feeding low and open near the tea house. While having lunch at the Japanese restaurant we were visited by couple of Dusky Langurs, and we got views of several Siamang in the distant trees. They were very loud with their morning calls. 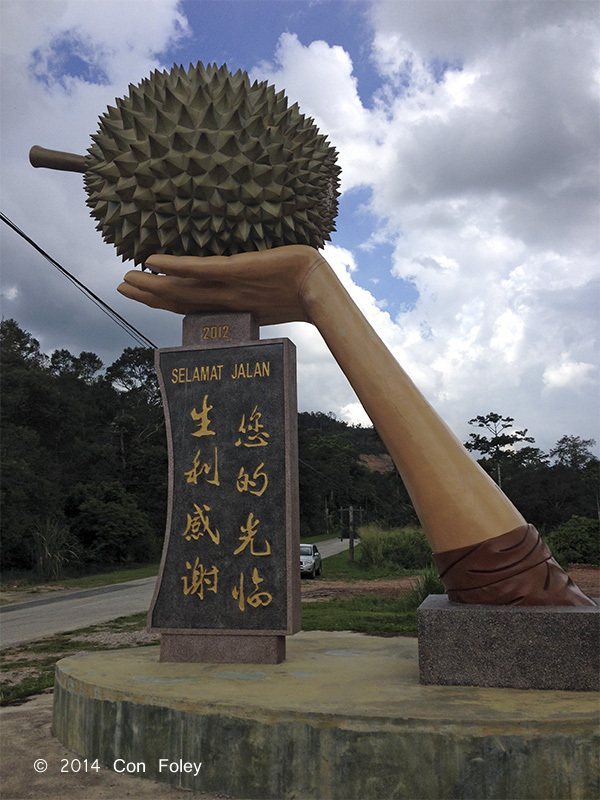 The largest durian (concrete) that I’ve ever seen, enroute to Fraser’s passing through a large area of durian plantations. Leaving Bukit Tinggi around 1pm we headed to Fraser’s Hill. On the road up we stopped for a woodpecker call and got an adult and juvenile Rufous Piculet and a bonus Moustached Babbler. Later we stopped at a large stream and got a Chestnut-naped Forktail. I think we finally reached the hilltop around 4pm and after checking in we were back out for a late afternoon birding session. First trying Jelai Resort there was nothing happening there, and then a slow ride towards Hemmant Trail we heard calling Great Hornbills, but just out of sight and they would not come into view, it was drizzling now and they didn’t want to fly. Friday morning we were up early for a try for the endemic thrush. No show. Then we did a drive around Telecom Loop seeing a couple of large bird waves and racking up the sightings list. We were so engrossed we almost missed breakfast and had to skip that last part of Telecom Loop in order to rush back before the buffet closed. After our late 10:30am breakfast we headed down to the waterfalls to try for the regular Slaty-backed Forktail. We waited beside the stream for at least half an hour, no luck, so we started walking out; and there he was on the trail! Of course he flushed immediately but a bit of searching lead to some great views. Saturday morning we were up early again and this time we got the thrush 🙂 Then Bishop Trail hoping for wren babblers and pittas. Neither was to be had, but rain was coming and neither of us brought rain gear, so we hiked back out before getting too wet. I got a messy leech bite and no birds. After a late buffet breakfast, and trying Telecom Loop again, half way around we encountered a fallen tree that was way too heavy to move. So we went back around to the beginning and then went in a short way in the reverse direction, Telecom Loop being officially but often ignored a one way street. As we were going in we flushed a Dark Hawk Cuckoo who was sitting on the electric wires. A bird not often seen at Fraser’s and a good recent split from the Large Hawk Cuckoo. As it was still poor weather at the top, rainy and windy, we drove down New Road hoping for the New Road specialties hornbills and Blyth’s Hawk Eagle. To my great surprise we encountered a couple of large bird waves, one producing a Blue Nuthatch! And then we stopped at a call I wasn’t entirely sure what it was, and it turned out to be a flock of Black Laughingthrush, the first time I’ve seen this species on the New Road. Later in the day we stopped at Hemmant Trail and again encountered Black Laughingthrush, the first time I’ve seen them on the top of the hill! Our last morning we tried Jelai Resort, arriving before dawn, hoping for the Green Magpie and Malayan Laughingthrush which had still eluded both of us. But the morning bird wave was rather unspectacular, with mainly just Long-tailed Sibias and Spectacled Laughingthrushs. So we headed over to Jalan Magar to try for some of the skulkers we needed. Almost as soon as we parked the car we got several Streaked Wren Babblers, that was easy! And then shortly a close Lesser Shortwing gave good views in the stream bed. To be followed up with a Pygmy Wren Babbler that came in within 2 meters. Three skulkers within an hour of birding, way too easy! 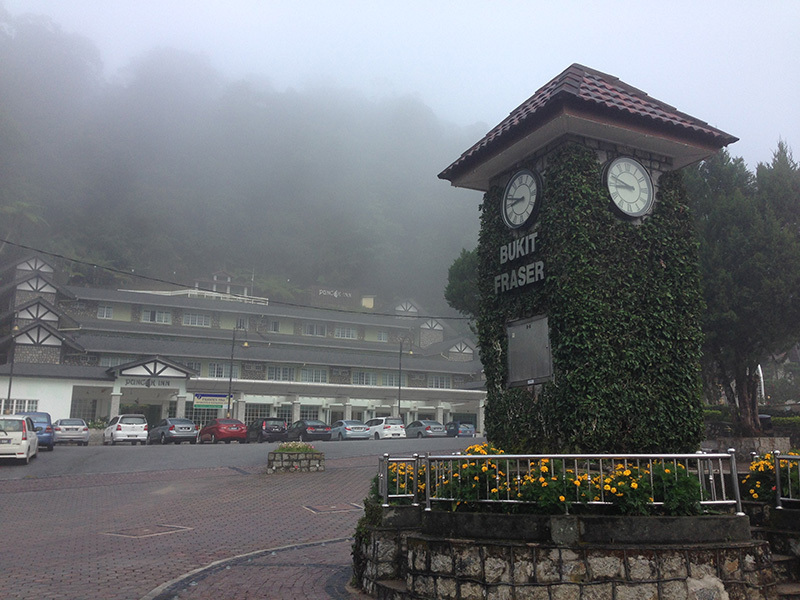 A typical misty morning in Fraser’s Hill on our last full day, Sunday, August 17th. But we were not going to get another tick for several more hours. Making our way around a rather birdless Telecom Loop we got half a tick with a White-rumped Munia that disappeared all too quickly. Mid afternoon we headed down to Jeriau waterfalls. Just at the spot were the major road slide had been repaired we stopped for a loud drongo, and slowly it dawned on me it was not a drongo but rather the Green Magpie we needed, making it’s raucous calls. And after some searching with bins, we got it into view. One of Fraser’s Hill signature birds. We stopped at several spots on the way down to the falls, and at one of these a bird suddenly flew left and revealed itself to be a male Red-headed Trogon, finally! And then in the grasses near the waterfall carpark, we saw a number of White-rumped Munias so we got the other half tick for this species. And, on the way back up we had our third encounter of the trip with a flock of Black Laughingthrushs. Since my companion still needed the Malayan Laughingthrush out of desperation with headed over to Jelai Resort, but no happiness for this species was to be had. Instead a Black-thighed Falconet flew onto the roof of Jelai Resort and began eating a large insect it had caught, that was a happy bonus! Finally on Monday Aug 18th it was time to drop my birding companion at KLIA, and after that I completed the drive back to Singapore. This trip was a pure twitch, so no boring bird photos from me. Instead below is a checklist of what we saw and heard. A pretty satisfying set of birds, nothing new for me, but still many many great views. The major dip being Rusty-naped Pitta, we did not hear a single one over four days, despite trying at spots I have heard them before, and despite reports of calling birds just two weeks prior. Your bird photos are never boring! It is still a good trip despite the misses.